This season has been the worst season for snowfall in Tahoe since the winter of 76/77 so we haven’t been getting as much skiing in as normal. November, December, and January were much below average snowfall and it didn’t really start snowing until mid February when we had a couple of huge snowfalls and lots of smaller ones. February was in fact the first month of above average precipitation in Tahoe since December 2012. Unfortunately, it has also been really warm so there is very little snow below 7,500′. There is NO snow at our house in Meyers at 6,400′, which is the first time I can remember that happening in early March. With all this bad snow news, you would think that the skiing has been horrible, but that’s not the case at all. It was VERY cold in early December so the resorts were able to make a lot of snow. Early – season we got some great skiing at both Northstar and Heavenly, which both have lots of snowmaking. 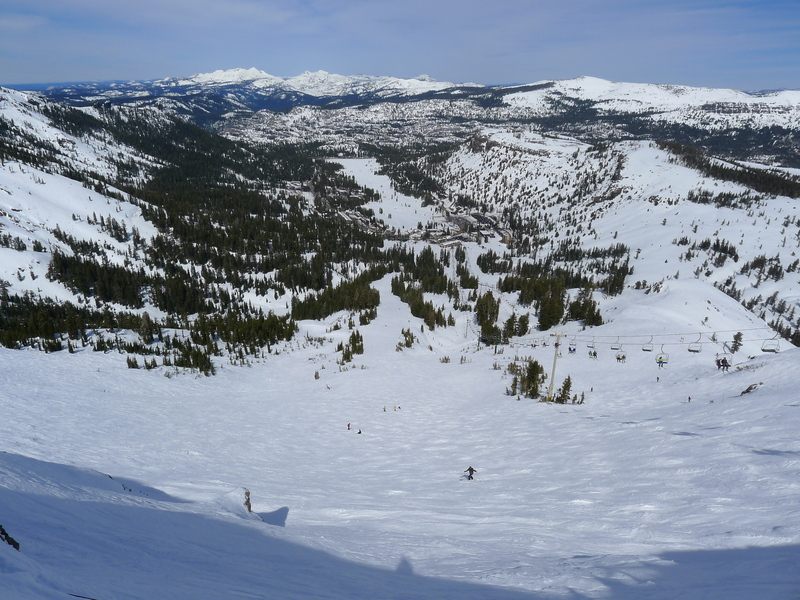 Later some small snowfalls kept Kirkwood and the other resorts going with reduced terrain. The poor snowfall kept the crowds away which was a huge bonus for both skiing and driving. With the base elevation at Kirkwood being 7,800′, almost all the precipitation that fell in February was snow, and their annual total is now up to 296″ up top (!). Pretty good for a really bad snow year. We skied there on Saturday and the mountain was 100% open with great coverage everywhere. Grooming was excellent early in the day and they had groomed 4 of the steep runs off of chair 6, which is something I have never seen before. The north-facing upper slopes stayed cold and fluffy, but later in the day it did get a bit slushy at the bottom in the sun. Sunday at Heavenly was great with awesome grooming and cooler temps due to cloud cover. There is still great coverage above 8,000 feet, but everything below that is hanging on by a thread. 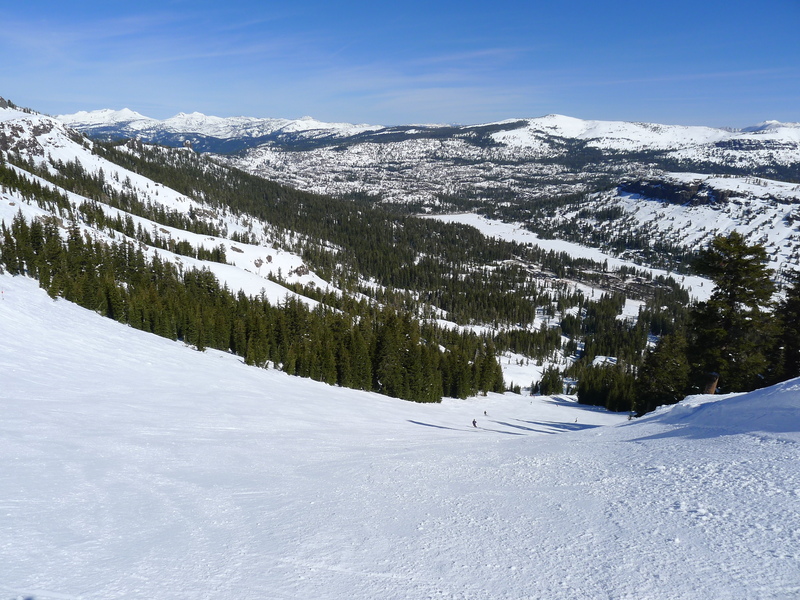 There is now only one run open down to the bottom of California — East Bowl. Everything else is bare. Stagecoach probably has only 1-week left. We racked up almost 17,000 vertical both days and it was a lot of fun. Now we head into Spring with even warmer temps so not sure how long this is going to last, but hopefully there will be a couple more storms with cold temps to freshen things up and keep it going through April. I put up a new review this weekend: Brighton, Utah. I also changed the rating system after thinking about it for a while. The ratings are now using only whole numbers from 1-5. A 1 is basically horrible, 2 is well below average, 3 is average, 4 is well above average, and 5 will be a top 10 resort that is truly special. I felt that it was too difficult to distinguish between a 4.5 and a 4.6 for example, so this rating system is more clear and usable. This entry was posted in Uncategorized on March 10, 2014 by Ron Thompson.